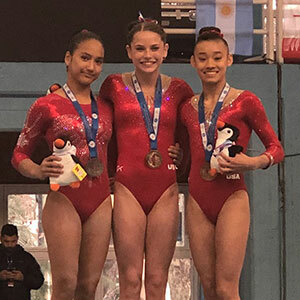 BUENOS AIRES, Argentina, June 13, 2018 -- The USA won the women’s team crown at the 2018 Junior Pan American Championships at the City of Buenos Aires (Argentina) Club. Jordan Bowers of Lincoln, Neb./Solid Rock Gymnastics, won the all-around gold medal, with teammate Leanne Wong of Overland Park, Kansas/GAGE, grabbing the bronze. The U.S. men compete in the team and all-around finals tomorrow. The competition is a qualifier for the 2018 Youth Olympic Games, which will be held in Buenos Aires in October. The USA took top honors in the team competition, followed by Canada and Argentina. Bowers’ 54.750 easily claimed the all-around gold. Canada’s Zoe Allaire-Bourgie was second at 53.450. Wong earned a 52.950 for the bronze. The all-around rankings only recognize the top two per country. Tori Tatum of Chanhassen, Minn./Twin City Twisters, tallied a 52.600 for the fourth highest all-around score. JaFree Scott of Independence, Mo./GAGE, competed on two events. The USA’s individual event scores were: Bowers – vault/14.650, uneven bars/13.700, balance beam/13.200, and floor exercise/13.200; Tatum – vault/14.800, bars/12.700, beam/12.300 and exercise/12.800; Wong – vault/14.700, bars/13.100, beam/13.700 and floor/11.400; and Scott – bars/12.800 and beam/12.550. The U.S. women qualified two athletes to each of the four event finals: vault – Tatum and Wong; bars and beam – Bowers and Wong and floor – Bowers and Tatum. The U.S. men compete in Subdivision 2, which starts at 2:30 p.m. ET. The members of the U.S. Men’s Team are: Brandon Briones of Gilbert, Ariz./Aspire Kids Sports Center; Taylor Burkhart of Morrison, Colo./5280 Gymnastics; JR Chou of Cypress, Texas/Cypress Academy of Gymnastics; and Isaiah Drake of Los Angeles/Gymnastics Olympica USA. Joshua Karnes of Erie, Pa./Lakettes Gymnastics Academy, is the alternate. The remaining competition schedule is (times are subject to change): June 14 – men’s event qualification and all-around and team finals, 10:10 a.m. ET, Subdivision 1, and 2:30 p.m. ET, Subdivision 2; and June 15 – men’s and women’s event finals, 10 a.m. ET (men’s floor, Pommel horse and still rings; women’s vault, uneven bars), and 3:10 p.m. ET (men’s vault, parallel bars and horizontal bar; women’s balance beam and floor). 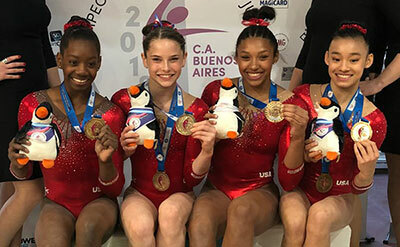 Seven athletes, with a maximum of one per country, qualify for a Youth Olympic Games berth based on the all-around results from the qualification competition. To be eligible to qualify a berth to the Youth Olympic Games for their country, female gymnasts must be born in 2003 and male gymnasts born in 2001-02. The USA is trying to qualify in men’s gymnastics, rhythmic gymnastics and trampoline.